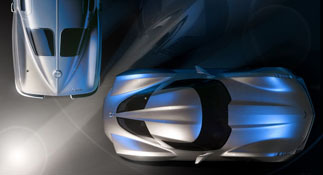 Chevrolet is working on an old concept in the new C7 Corvette, the Split Window Coupe. While the 1963 Split window had a one year production run, it is the icon of the Corvette series and is synonymous with the Corvette. The concept was given a boost this last summer when the concept appeared in the second transformers movie and the speculation continues as to when the car could be launched into production. The demise of the ’63 Split Window was the limited visibility out the rear of the car, but with modern technology the view can be covered by backup cameras and blind spot detection systems. Can’t wait to see the real thing.